What is commercial insurance ? Few things in life are riskier than launching and running your own small business. Part of the risk of any small business is the loss of critical tools and property or liability to others, either of which can cause loss of income or even force you to close your doors. Large companies employ full time risk managers to keep their risk taking to a minimum. But chances are that as a small business operator, the company’s risk manager, along with its personnel director, office manager and possibly the entire staff all rolled into one. Keeping risks and losses to a minimum is a cornerstone of business success, especially for small businesses. 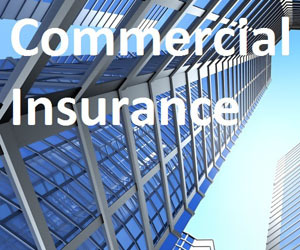 Commercial insurance involves protection for businesses and organizations. Businesses purchase property insurance, liability insurance, workers compensation, automobile insurance and a variety of other policies designed to protect the assets of the organization in the event of an unexpected loss. Generally, there are two types of commercial business insurance, property and liability. Property insurance covers damage to or loss of the policyholder’s property. And if somebody sued for damages caused by you or your possessions (other than a vehicle covered by your insurance policy), the cost of the suit, both defending it and settling it if necessary, would be covered by your liability insurance. Avoiding donut disaster : the corner donut shop purchases commercial insurance to protect its equipment from loss due to fire or theft, liability insurance in the event someone is injured on their property or becomes ill after eating one of the donuts, worker’s compensation insurance in case an employee is hurt on the job, and automobile insurance for the company van. They might also secure insurance for cash they have in the register if they are robbed, for their loss of income if they are shut down due to a fire at their location, or for a lawsuit brought by one of their employees for discrimination.So you can contact the commercial insurance companies and have a business insurance estimate to find out what you need and don’t necessarily need to insure.